From what I have read and heard in the media over the past few days, the two female New Democrat MPs who alleged improper conduct by two male Liberal MPs won’t be laying formal complaints. But, without formal complaints, on what basis can an investigation be launched? And, without an investigation, can justice be served? These are just the most obvious questions arising from the mess on Parliament Hill. Another might be: In what environment or on what occasion would two MPs from two different opposition parties be present so that the men had the opportunity to harass or assault the women in question? In other words, I hadn’t thought it likely that female NDP MPs would be socializing with male Liberal MPs. Just how compromising are the allegations? Would it embarrass or incriminate the two female MPs if the circumstances were known? It’s never fair to blame victims, and sexual harassment or assault—if that is what has happened here—can be an especially egregious crime. But the accused have rights too, especially in this case when they have already been punished and publicly shamed. And what are the rights of the public? Two MPs are suspended from their caucus and the details of their wrongdoing are kept secret? Is that justice as we are accustomed to seeing it? In fact, it seems that all ordinary Canadians have are questions. The allegations themselves are non-specific—“serious personal misconduct,” we are told, and, yes, the accused have been named, but neither man seems to know the details of his alleged misconduct or the name of his accuser and, it should be noted, they both deny wrongdoing. Political careers of the two accused have been damaged—some say likely ruined—as, perhaps, have their marriages. Yet there seems little likelihood they will face their accusers or enjoy any legal protection whatsoever. And this in a country that treasures the rule of law and the fairness of our justice system. Furthermore, it is a disgrace that this unfolding injustice—perhaps unraveling is a better word—is playing out under the very noses of our nation’s lawmakers. The show of incompetence by both opposition leaders is stunning, as each looks elsewhere for a solution. And, apparently, the accusations are extremely serious, for I read in the National Post that NDP Whip Nycole Turmel said the two NDP MPs needed time to “find a way to heal” from the alleged misconduct. If one considers that the events are supposed to have occurred months ago, they must certainly have been egregious in nature if the victims still are looking for ways to heal. Again I remind you that these are our principal lawmakers. And, every year, they seem to encroach ever more into every aspect of our lives. But, apparently, even though MPs and staff members have for decades endured harassment, abuse, humiliation and sexual misconduct by other MPs and staff members, there remains no formal process for handling such things. Liberal leader Justin Trudeau suspended his two MPs and called for misconduct procedures back on Nov. 5, and it’s taken until today for the all-party Board of Internal Economy committee to address the issue—behind closed doors, of course. Even then, any new harassment policy will likely deal only with future complaints and not the recent allegations that led to the suspensions. Which, of course, begs another question: If the current case and its details are not being dealt with, why the need for a closed-door meeting? Why shouldn’t ordinary Canadians be privy to the discussions and hear the arguments for and against the various options discussed at the meeting? I thought transparency was a good thing? I guess we’ll just have to wait to hear what our MPs decide we should be allowed to hear. Today I remember my Uncle Capt. 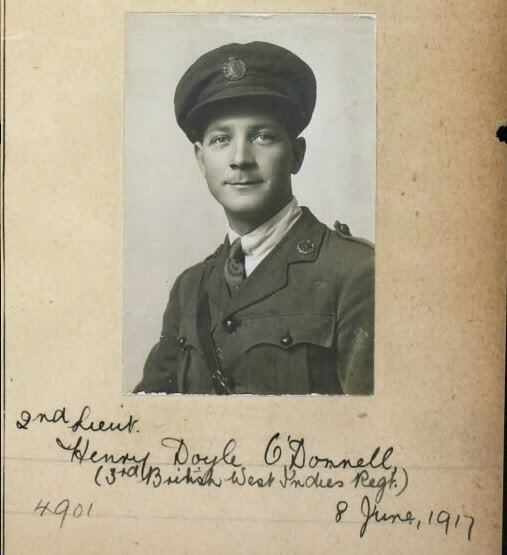 Henry Doyle O’Donnell who served in World War One, the Great War of 1914-1918. He was the son of my paternal grand mother Ambrosine Albertha nee Ramsay and her first husband Henry William O’Donnell of Jamaica, West Indies. Henry Doyle O’Donnell was born on October 16, 1894 at Montego Bay in the parish of St. James, Jamaica. His father died in about 1900 and his widowed mother married my grandfather Donald Harcourt Campbell in about 1902. On January 7, 1916, Henry sailed from Kingston, Jamaica with the Second War Contingent for training in England. He was a 2nd Lt in the 3rd Battalion of the British West Indies Regiment and was attached to the Royal Flying Corps (RFC), a forerunner of the Royal Air Force. On June 8, 1917, Henry received his pilot’s license (No. 4901), at Military School, Ruislip, having taken his certificate on a Maurice Farman Biplane. Later, Henry met Elizabeth (Dorlie ?) Gardiner who he married on June 24, 1917 at Musselburgh, near Edinburgh, Scotland. Henry survived the war, but died in 1924, at which time he held the rank of Captain. He is buried in the London Borough of Richmond upon Thames, England at the Richmond & East Sheen Cemeteries. May Capt. Henry Doyle O’Donnell rest in peace. Is the mess in Ottawa further proof neither Mulcair or Trudeau is ready to be PM? If one listened only to opposition leaders, Thomas Mulcair and Justin Trudeau, one would get the impression Canada and our economy were headed to hell in a handbasket. Canada unexpectedly added 43,100 new jobs in October, and the unemployment rate dropped to a nearly six-year low of 6.5 percent, prompting market optimism that the sluggish job market might finally be improving. “Analysts had expected a loss of 5,000 jobs after September's gain of 74,100 positions. Pretty good news, all things considered, and news that is consistent with the good economic performance Canada has enjoyed generally under the Stephen Harper Conservative government, especially when we compare Canada to other Western democracies. When I see a report like this, I can’t help asking myself what sort of economic performance we could have expected had either Mulcair and his Dippers or Justin Trudeau and his Grits been at the tiller. And I usually give a big, Thank You, that neither leader had the chance to lead our country, especially through some of the trying times during the 2008-2009 recession. In the past few days we’ve also received further confirmation that neither Thomas Mulcair nor Justin Trudeau have the chops to run this very complex country. To wit: misconduct allegations were levelled by two New Democratic MPs against two now-former Liberal Members of Parliament. And how do these prime ministers-in-waiting respond? Poorly, that’s how. After their ham-fisted handling of this sensitive affair, we have a mess with charges and counter-charges being exchanged by the two opposition parties. On the one hand we have two MPs being suspended from the liberal party caucus—a de facto presumption of guilt—and on the other we have Mulcair pretty much suggesting Trudeau re-victimised the alleged victims by going public with the information against their wishes. Trudeau seems to be trying to deflect criticism by pointing out Parliament has no set procedure for handling such cases. But I ask, So what? Surely, as one who claims he is ready and able to run our complicated and sophisticated nation, he has the judgement and leadership skills to handle allegations of misbehaving MPs in a confidential and sensitive manner. As for Mulcair, one wonders why his MP felt she had to seek out Trudeau to make her complaint instead of taking the issue to Mulcair himself. And, once he was informed of the allegations, why wasn’t he more on top of what was transpiring before Trudeau made the affair the subject of public speculation and gossip? Couldn’t these leaders have gotten together and worked out a process by which the allegations could be addressed confidentially and the Liberal MPs, if found guilty, be censured in an appropriate manner? In my opinion they could had they been made of finer stuff—you know, the stuff of which prime ministers are made. In closing, I’m bothered by the fact two MPs have been named and shamed and probably had their political careers ruined and their private lives and those of their families seriously impacted in a most negative manner and no formal charges have been laid and no evidence against them has been disclosed. Nor have either man had the opportunity to face his accuser. This seems very unfair to me. Equality under the law is one of the corner stones on which our democracy has been built—except, of course, any law pertaining to taxes. In other words, when it comes to tax law, the principle of equality is pretty much irrelevant. Take the case of the controversial income-splitting proposal announced by Prime Minister Stephen Harper last week, and pretty much universally panned by media and political party critics across the land. Opposition to income-splitting is based mainly on the contention that it is not fair because only a relatively few well-healed taxpayers would benefit. But how about the status quo? Under the present system, families whose incomes are earned primarily by one spouse are taxed a significantly higher amount than those families with two spouses each earning about the same amount. Recently in the Financial Post, economist Jack Mintz calculated single-earner families with $80,000 total income will each pay $4,170 more tax than families whose spouses each earn $40,000. So, two families living next door to each other—both earning the same total income—pay very different amounts of tax. How fair is that? And what does that say about our cherished principle of equality before and under the law. Way back in 1966, the Royal Commission on Taxation under Kenneth Carter argued in favour of family taxation. Governments across Canada recognize this principle when dealing with several tax elements. That is, governments use family income when calculating eligibility for several tax credits such as the child tax benefit and GST credit. And none in opposition seem to see income-splitting of pensions by seniors as other than a good thing. So the general principle of using family income for calculating income tax would seem to be a sound one. Doesn’t this seem rather extravagant language even for the Toronto Star? I think, though, most readers have learned not to expect fairness and balance in the Star’s commentary. “[U]nfair and expensive income splitting scheme”? Really. Well, the NDP’s $15-a-day daycare plan will cost $5-billion over eight years, and millions of taxpayers will never see a penny’s worth of benefit because they have no eligible children or can’t get one of the 370,000 new licensed spots. This sounds pretty unfair and expensive to me. Liberal Leader Justin Trudeau was also not impressed with the Prime Minister's attempts to partially level the playing field for single income families, saying they were “not good enough.” And, as is typical of the Liberal leader, he did not offer a counter-proposal. So why do the Dippers and the Grits and their media cheerleaders so roundly condemn income-splitting? Politics, dear readers, crass politics. Even though neither I nor my children will ever see a penny from it, I’m with the Conservatives on this one. I just think it’s the right thing to do. Working to remedy injustice is always the right thing to do—and not a bad way to spend some of our federal surplus.